Everything about your stay in Israel with Onward Israel is potentially an educational experience. At your internship, on the bus back and forth from work, in your apartment with your roommates, and at night at a local pub; there are endless opportunities for learning and growing. Onward Israel aims to construct Israel experiences that provide participants with both a supportive, enriching framework and an independent immersion and exploration of Israel. Through the internships and additional experiences, Onward Israel hopes that people complete the summer in Israel with a sense of personal accomplishment, and with new skills, understandings, and questions related to future personal and career paths. Most Onward Israel participants have had the opportunity to meet Israel through a variety of quality introductory and initiation experiences on previous Israel visits and programs. Onward Israel strives to move beyond the initial encounter, beyond a tourist visit to an immersion experience – two months of living, working, and encountering Israel and Israelis. Onward Israel programs seek to deepen participant’s familiarity and connections with Israel and Israeli life. Identity in the 21st century is in an unprecedented way about choice. In so many ways, how we live and who we want to be are issues that demand personal exploration, reflection, and choice. Onward Israel aspires to provide participants with meaningful opportunities to explore their connections to Judaism and Jewishness in a setting that honors diversity and encourages people to be active players in Jewish life and meaning making. Onward Israel provides the educational vision and supervision for all educational activities taking place under the umbrella of our more than seventy programs all around Israel. Our commitment is to provide compelling and authentic Israel living experiences and encounters in all of our programs. Beyond the array of evaluation reviews with participants during all Onward Israel programs, the Rosov Consulting Firm provides external evaluation services to Onward Israel at the highest professional level. Educational experiences are impactful when they meet people where they live, and help them consider significant questions about who they are and who they want to be. Creating respectful space – room for shared conversation and listening – is central to good educational practice. Because Onward Israel values our program participants and their experience, all Onward Israel programs include an element of choice, and encourage both agency and initiative. For an educational opportunity to be truly enriching, the learning must also take responsibility and contribute to the process. We live in an information age, and sometimes the volume of information that engulfs us makes it difficult to discern between the trivial and the essential. Onward Israel is about growth – the personal, the professional, and the identification and engagement with Judaism, Jewishness, and Israel. Growth is nurtured not by exposure to trivia, but by encountering new sources of inspiration, finding points of relevance, and contending with questions of personal meaning and responsibility. Onward Israel aspires to offer opportunities where encounters with key issues and multiple voices offer people the chance to consider their own positions, learn more, and gain both confidence and knowledge. The story of Israel is incredible on a variety of levels, and in the context of Jewish history, modern Israel is an epoch-making daily miracle. With that said, no place is perfect and Israel is ripe with accomplishments, challenges, and complexities. Israel is also a place that along with its own unique context and experience, is a dramatic hotbed of global issues – security and peace, immigration and borders, national-religious versus more international-global identity, our relation to land and the environment, to name a few. Onward Israel aims to assist participants to see both the roses and the thorns of Israel – to celebrate the accomplishments and consider the challenges. How are local Israeli issues global and how participants can take home from Israel inspirations and insights about issues taking place in their own campuses and communities? Alongside the professional internship or other type of professional growth experience, Onward Israel offers participants a wide range of enrichment and educational opportunities. All Onward Israel programs open with an orientation that includes some of the following: reviewing regulations and frameworks, sharing expectations and goals, beginning to get to know the people in the group, touring your neighborhood of residence, and an introduction to day-to-day Hebrew. Amos Oz, one of Israel’s most important authors, writes: ‘Israel is a fiery collection of arguments, and I like it this way, although it is no garden of roses…’ The Israel Seminar is a chance to encounter Israel and to engage with the issues that Israelis deal with on a daily basis. Based on each program’s organic group, each group will visit various parts of the country, meet Israelis of a variety of opinions and outlooks, and contend with key issues of the day; like the conflict and the chances for peace, religion and state and Jewish identity, minorities and Israeli democracy among others. All Onward Israel programs will take part in three Israel seminar days throughout their eight week program organized and implemented by the program organizer and staff. Days will be divided between enrichment and education experiences, and recreational, volunteer, and social activities. Participation is mandatory for all Onward Israel participants. Although the internship is an individual experience, every Onward Israel participant is a member of a program-based peer community numbering, depending on the specific program, from 15 to 50. During the course of the summer, groups will meet four times with the program facilitators and counselors (madrichim). Besides providing a chance to deal with logistics and planning, each of these meetings will be devoted to the shared group experience – group dynamics, meetings with Israeli peers, getting to know better the group’s city of residence, reflection, and discussion. Throughout the summer, Onward Israel produces a series of Breakout Shabbatonim from Thursday late afternoon and through Saturday night. Each breakout is built around a central theme, and takes place in a different part of Israel. During summer 2017, Breakouts included – Geopolitics Today (Jerusalem Area), My Shabbat (Tzfat), Ecology & Sustainability (Hava V’Adam Eco-Farm), Israel’s Human Mosaic (Galilee). Breakouts are designed to bring together Onward Israel participants from a variety of programs, to engage with a specific area of interest based on individual choice, and to visit a part of Israel outside of the specific program’s city of residence. Participation in one Breakout retreat during the course of the summer is mandatory for all Onward Israel participants. Participants will choose the Breakout retreat of their choice. During spring 2018, Onward Israel participants will receive a full menu of Breakout retreat choices and will be instructed how to register. Some specific Onward Israel programs like Tamid, ISBA, and Jinternship will take part in a weekend retreat within their specific program community. Please consult with your program director for more details. 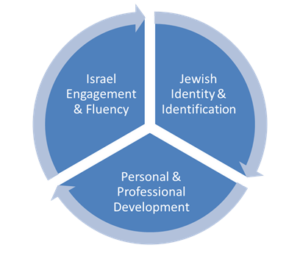 Chug Activities are a series of short enrichment and educational opportunities dealing with personal and professional development, Jewish identity and identification, and Israel engagement and fluency. Each weekender will focus on a different topic based on Onward Israel’s key content areas (see above) and will include up to 3 hours of activity in the various cities where Onward Israel participants reside. Weekenders will include tours, lectures, discussions, text studies, and encounters in a creative and compelling fashion, and are another opportunity to meet other Onward Israel participants around a shared topic of interest. Topics will be drawn from Onward Israel’s core content areas – personal and professional development, Jewish identity and identification, and Israel engagement and fluency. Activities will take place from Thursday evening, on Friday, on Saturday, and on Sunday evening. . Participation in one Chug Activity during the course of the summer is mandatory for all Onward Israel participants. Participants will choose the Chug of their choice. During spring 2018, Onward Israel participants will receive a full menu of Weekender choices and will be instructed on how to register. Providing an opportunity for Onward Israel participants from across the gambit of our programs to meet and celebrate the summer together is central to the Connections evening. During the summer of 2017, over 1500 Onward Israel participants took part in the Connections conclave. Eating together and making time to celebrate is a tremendous community builder, and Shabbat evening provides a perfect opportunity to take time to appreciate the accomplishments of the week, and sharing time with friends. This idea was inspired by the One Table initiative. Onward Israel provides a subsidy (40 NIS per person once during the summer) to participants and madrichim who want to host together a shabbat dinner. Interested participants and madrichim are encourage to turn to Onward Israel about this opportunity. All requests will need to be accompanied by a proposal including a budget and educational/cultural program. More details will be provided as Summer 2018 programs arrive in Israel. Onward Israel is about making the most of your summer, about being a prosumer and not a passive consumer. If you have an idea for an event that you would like to share with the Onward Israel community, you are invited to be in touch to pitch your proposal and make it happen. Proposals must bring together in a meaningful way Onward Israel participants for networking and enrichment opportunities. A committee of Onward Israel professionals will consider all proposals and the best will be selected for Summer 2018. More details will be provided as Summer 2018 programs arrive in Israel. Getting out and about and seeing Israel is a central part of the Onward Israel experience. Onward Israel Fridays will be a series of outings on select Friday mornings that offer participants a chance to visit and/or revisit some of Israel’s most central cultural and historical sites. Participation is optional. More details will be provided on the Onward Israel application with the opening of programs on the ground in Israel. The Onward Israel app is the fundamental tool linking together the Onward Israel community. In Israel, the app is the hub for information and updates regarding program itineraries and details, special opportunities, and free-time suggestions. For Onward Israel graduates, the app continues to provide valuable information about personal and professional opportunities, updates on Israel and the Jewish world, and discounts and unique offerings for all things Onward Israel. Please download the app for either Apple or Android. Each Onward Israel program contains its own unique aspects – including programs that include volunteering experiences, Jewish study in both orthodox and pluralistic settings, and site visits and encounters with Israeli business and high tech. Please check the specific Onward Israel program profile for more details regarding the program of your choice.